I want to start off my blog with some biographical context about how I found cognitive psychology. Unwittingly, my journey started when I was a junior in high school. I had a truly life-changing experience as an exchange student in Komatsu, Japan (known for Komatsu bulldozers and kutani pottery). When I look back on that year, I am truly grateful to the host families, high school teachers, and students who taught me about the Japanese way of life. It has had a profound effect on my life and it continues to affect my worldview. The next logical step was to continue studying the Japanese language and culture in college. Consequently, I graduated from Barnard College with a B.A. in Asian studies. Early in my college career, I considered rounding out my education with a degree in international law. That all changed after I took a course in social psychology my senior year. I don’t remember much about the class, but the assigned lab was my favorite class as an undergraduate. Unfortunately, I can’t recall the name of the graduate TA who taught the class, but she was a terrific teacher and taught us how to design experiments and how to analyze the data using the statistical package, SPSSX. We created our own experiments, collected data, and used the computers at Columbia’s Teacher’s College across the street to analyze the data. I loved it! When I graduated the TA for the class recommended me for a job working for a research group that was designing user interfaces for ATMs. At that time ATMs were a new technology and there was a lot of room for improvement to be sure, but I didn’t really see the link between social psychology research and user interfaces (I have learned since that there is an important connection!). Around the same time, I had heard a talk by the eminent Japanese speech pathologist, Sumiko Sasanuma, at Mount Sinai Hospital. She presented her research on aphasic patients who were impaired in their ability to read Japanese (see Sasanuma, 1975). In the chart below, you can see that Japanese is written using kana characters which are phonetic symbols and kanji characters which are derived from Chinese logographic characters. 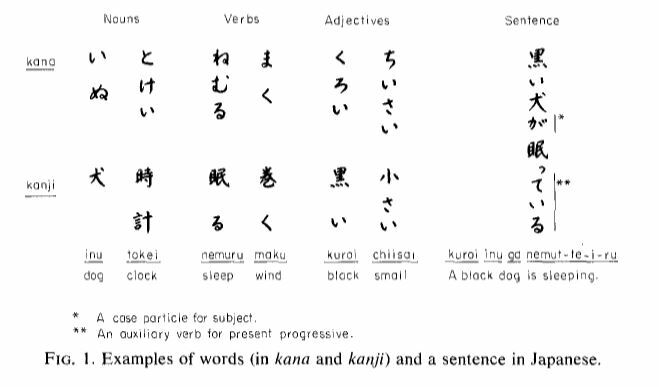 I left the talk intrigued by the idea that the brain performed distinct cognitive processes when reading different Japanese writing scripts and I wanted to know how to do that kind of research. My boyfriend (my husband-to-be) was a doctoral student in neuropsychology and told me that the best way to break into psychology research was to get a job as a research assistant in a lab. Thus began my odyssey as a research assistant in the labs of Stephen Kosslyn, Michael Gazzaniga, and George Miller. They were amazingly generous in their support and I learned a great deal about how their theoretical ideas guided the way research was conducted in their labs. Even today, I am still captivated by the process of conducting research. My research experiences led me to the doctoral program in cognitive psychology at Princeton. That is a whole other story that requires a separate post. This entry was posted in cognitive psychology and tagged cognitive psychology, George Miller, Japanese, Michael Gazzaniga, research, Stephen Kosslyn, Sumiko Sasanuma by Allison M. Hermann. Bookmark the permalink.